We’d love your help. 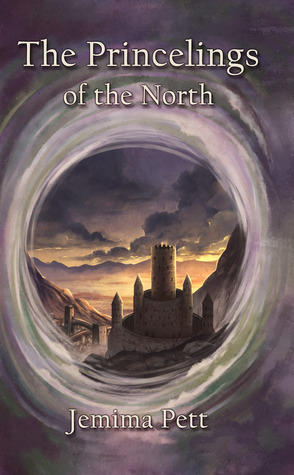 Let us know what’s wrong with this preview of The Princelings of the North by Jemima Pett. The Princelings of the North is the eighth in The Princelings of the East series. Princelings Dylan and Dougall, who live in the far northwest of an island off the northwest coast of the Realms, rescue an exiled prince, and battle against the odds to restore him to his birthright. Irrepressible Dylan and steady Dougall are inseparable denizens of the tiny castle of Haunn, s The Princelings of the North is the eighth in The Princelings of the East series. Princelings Dylan and Dougall, who live in the far northwest of an island off the northwest coast of the Realms, rescue an exiled prince, and battle against the odds to restore him to his birthright. Irrepressible Dylan and steady Dougall are inseparable denizens of the tiny castle of Haunn, so far away from the rest of civilisation that it’s almost off the map. And maps are one of the key elements of this intricate adventure. Dylan finds a treasure map inside a bottle washed up on the shore – and he reckons he knows where X is. Instead of treasure, he finds the exiled Prince Kevin of Castle Deeping, antagonist in the Talent Seekers, bit-player in Bravo Victor, and mystery prince in Willoughby the Narrator. Kevin has had time to realise what a fool he’s been, and now wants vengeance and his castle back, which is just the sort of adventurous challenge that Dylan craves. Dylan and Dougall have both appeared in print already; they star in tales in the two BookElves Anthologies. The novella Dylan’s Yuletide Journey, which appeared first, is also available as a free ebook. These two lovable characters finally get their own full-length adventure, something they’ve always threatened, and they travel virtually the full length of the Realms to achieve it. Check the series website for maps of the Realms to download. Prince Kevin has an equal part in this adventure; he’s been hoodwinked by his evil uncle for so many years it takes a summer of isolation for him to come to his senses, although whether his plans are entirely sensible are for the reader to judge. To ask other readers questions about The Princelings of the North, please sign up. This is the latest book in my Princelings of the East series, and it looks like their world is heading towards civil unrest at the very least. Dylan and Dougall rescue Kevin, who has been acting like a spoiled brat since book 5, the Talent Seekers, when we first encountered him. Now he's acting like someone who has been on his own for too long, and while sounding sane in short bursts, has plans that seem unrealistic in the longer term. Dylan just sees the adventure ahead. Dougall would rather wat This is the latest book in my Princelings of the East series, and it looks like their world is heading towards civil unrest at the very least. Dylan and Dougall rescue Kevin, who has been acting like a spoiled brat since book 5, the Talent Seekers, when we first encountered him. Now he's acting like someone who has been on his own for too long, and while sounding sane in short bursts, has plans that seem unrealistic in the longer term. Dylan just sees the adventure ahead. Dougall would rather watch the stars, since he's an astronomer, something that comes in handy, as it turns out. I got an exciting sneak preview. Review coming in January! A very nice read. Adventurous ride which adults can enjoy as well! This is the book 8 in the series but one can even read it as a standalone, as the author has given character introductions in the beginning itself. It's very easy to grasp the story and get engrossed with the Princelings Dylan & Dougall and exiled Prince Kevin's journey! The writing is simple and neat, engaging throughout. The chapter drawings and its one-two line details are great ideas! I loved the story and all the character A very nice read. Adventurous ride which adults can enjoy as well! The writing is simple and neat, engaging throughout. The chapter drawings and its one-two line details are great ideas! I loved the story and all the characters, a nice travel with fantasy and kingdoms and power games! And happy with the good ending too!! This was a really enjoyable read in a genre with which I am not particularly familiar. I read it and so did my eight year old. We both enjoyed the story and the characters. Dylan and Dougall are a great pair and very realistic brothers. I liked how the author created worlds and wrote a self-contained book even though it was part of a greater series. The writing was crisp and the story was wholesome yet exciting. I would definitely recommend this book and look forward to reading more in the serie This was a really enjoyable read in a genre with which I am not particularly familiar. I read it and so did my eight year old. We both enjoyed the story and the characters. Dylan and Dougall are a great pair and very realistic brothers. I liked how the author created worlds and wrote a self-contained book even though it was part of a greater series. The writing was crisp and the story was wholesome yet exciting. I would definitely recommend this book and look forward to reading more in the series. I've been looking forward to reading this book since I heard it was going to be coming out, and was not disappointed! This book is an excellent addition to this series. The plot is entertaining and exciting, while the characters are interesting and believable (yes, I know they're guinea pigs, but there's no reason a guinea pig can't be a believable character). *NOTE: I was given an advanced copy of this book in exchanged for an honest review. This fact has in no way influenced either my opinion o I've been looking forward to reading this book since I heard it was going to be coming out, and was not disappointed! This book is an excellent addition to this series. The plot is entertaining and exciting, while the characters are interesting and believable (yes, I know they're guinea pigs, but there's no reason a guinea pig can't be a believable character).